Summary: “Bath time!” says the mama. “No, no!” says the boy. “Yes, yes!” says the mama. This scenario is repeated throughout the book in different countries, and with the no’s and yesses in different languages. In Japan, family members bathe in age order in a large square tub called and afuro. In Alaska, the family enters a steamy maqil. Some day, a weightless mother may be chasing her floating child for a bath on board a space station. From the Ganges River in India to the hot springs of Himalayan valleys to a muddy volcano in South America, kids resist taking baths, but often don’t want to get out once they’ve gotten in. Includes two final pages of additional information on bathing in all the places mentioned in the text. 32 pages; ages 3-7. Pros: An unusual geography lesson based on a universal experience kids will be able to connect with. 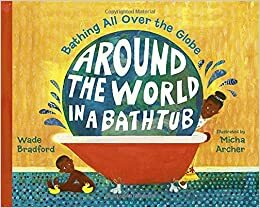 The illustrations feature a multicultural cast, with the bathtub scene reminiscent of a similar one in Ezra Jack Keats’ The Snowy Day. Cons: Naked kids on almost every page will be sure to elicit a lot of giggling at storytime.